President Joseph Kabila said today that Congolese authorities would arrest the now fugitive former rebel leader turned Congolese army general and ICC indicted war criminal Bosco Ntaganda. “I want to arrest Bosco Ntaganda because the whole population wants peace,” said President Kabila from the town of Goma in eastern Congo’s North Kivu province. 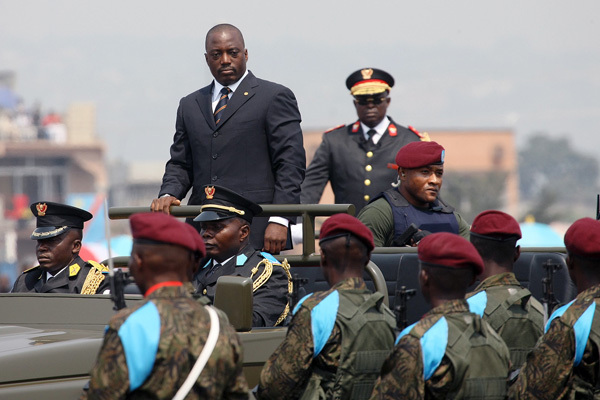 President Kabila traveled to Goma earlier in the week with a delegation of senior political and military leaders from Kinshasa seemingly to put pressure on the leaders of rebellious factions of the Congolese national army, or FARDC, who were loyal to Ntaganda. Most of these troops were previously members of the ethnic Tutsi rebel group the National Congress for the Defense of the People, or CNDP, which was linked to the Rwandan government. The FARDC subsumed elements of the CNDP after a 2009 peace agreement between the group and the Congolese government. Early last week, Ntaganda ordered FARDC troops loyal to him to defect from their ranks to protect him from what he saw as increasing domestic and international pressure to deliver him to The Hague or that might lead to his assassination. One third of the ex-CNDP soldiers under his command initially defected—roughly 600 troops—and since then around 100 troops and a number of high-level commanders have reportedly returned to the FARDC and await disciplinary action. Furthering the divide among the ex-CNDP factions, those ex-CNDP troops in the FARDC ranks that did not defect have been actively fighting or waiting for deployment against the deserting factions loyal to Ntaganda. This willingness of former Bosco loyalists to maintain positions within the state security apparatus, coupled with the recent arrival of additional battalions in Goma to combat the rebellion, suggest that Bosco is now outmatched militarily, and that his gamble at self-preservation could be rapidly deteriorating. Conjecture abounds in Goma as to Ntaganda’s actual whereabouts or how this tense situation might unfold. It has been reported that President Kabila met with Rwandan officials as well as ex-CNDP commanders in Goma, indicating Rwandan involvement in the outcome. At this point, it appears that a return to his previous position in the FARDC will not be an option for Ntaganda and that leaders in both Kinshasa and Kigali are under significant pressure to take action against the general. It also appears that Bosco’s attempt to flex his muscles when pushed into a corner has been unsuccessful, and that in the end justice is not necessarily the enemy of peace—the rationale previously given to justify not moving against Ntaganda. The opportunity for his apprehension is as great as it has ever been.